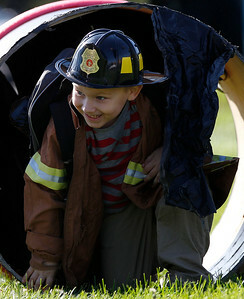 Matthew Apgar - mapgar@shawmedia.com Trevor Neveitt of Crystal Lake, 6, crawls through a tunnel in an obstacle course put on by the Crystal Lake Fire Department Station 1 during an open house on Saturday, Oct. 10, 2015 in Crystal Lake. 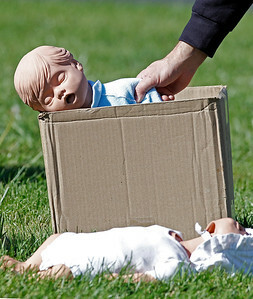 Matthew Apgar - mapgar@shawmedia.com Firefighter/paramedic Ray Jakubowicz places a doll in a box for children to rescue as part of an obstacle course during an open house at Station 1 of the Crystal Lake Fire Department on Saturday, Oct. 10, 2015 in Crystal Lake. Matthew Apgar - mapgar@shawmedia.com Gavin Dobler of Crystal Lake, 5, shows his excitement while using a firefighting hose with the help of firefighter/paramedic Sergio Delgado during an open house on Saturday, Oct. 10, 2015 at Station 1 of the Crystal Lake Fire Department in Crystal Lake. 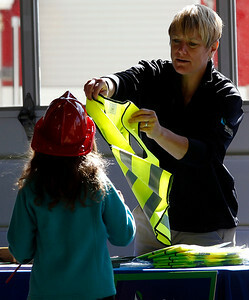 Matthew Apgar - mapgar@shawmedia.com Nicor Gas meter reading supervisor Stacy Paller hands a reflective vest over to Pearl Melton of Crystal Lake, 7, during an open house on Saturday, Oct. 10, 2015 at Station 1 of the Crystal Lake Fire Department in Crystal Lake. Trevor Neveitt of Crystal Lake, 6, crawls through a tunnel in an obstacle course put on by the Crystal Lake Fire Department Station 1 during an open house on Saturday, Oct. 10, 2015 in Crystal Lake.